Join Barb Q as she shows you how to make either one of these Mini Mosaic Quilts! This is a 2-day class. The first class will be held on Feb 24th from 1pm to 4pm. The second class will be held on March 31st from 1pm-4pm. Sew Many Things had the pleasure to meet Cheryl Lynch at the Houston Quilt Market this past month. What a wonderful lady. We are please to bring her quilting Technique to Sew Many Things. 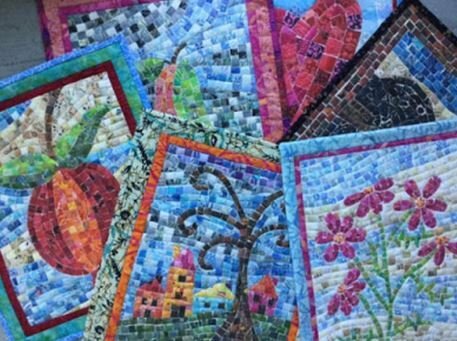 Linda stated that she was inspired by the mosaics she saw on a trip to Israel. As a quilter, she developed a technique to create mosaics from fabric. 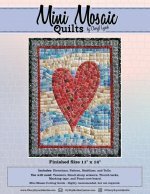 This technique was featured in the August 2016 issue of Quilting Arts. Cheryl has taught this technique in workshops for the last two years and has now decided to make up patterns and kits so that more people can have fun making Mini Mosaic Quilts. You can use your own batik stash to create this low sew method to make a Mini Mosaic Quilt that measures 11" x 14 or purchase a quilt kit from us. 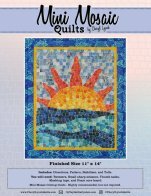 The Key West Sunrise kit contains over fifty 2 inch batik squares and the “grout” fabric needed to complete the mosaic top and is available for an additional cost. Pattern, Kit, and Mini Mosaic Ruler are sold separately. We provide 15% off on any supplies needed for class including pattern, kit, & Mini Mosaic Ruler.